A rather witty and vibrant tale, Numeroff’s If You Give a Mouse a Cookie is a remarkable story that truly depicts the adventures of raising a child. When a child decides to aid a very peculiar and needy little mouse, he doesn’t begin to realize just how much care and attention this cute and furry little fellow will need. Beautifully illustrated and exceptionally well written, Numeroff’s picture book will bring laughter to children and hidden amusement to the adult audience, especially those who’ve discovered the adventures of parenting. Will the young lad be able to keep up with the mouse’s demands? How will their venturesome day end? Originally, I was going to write individual reviews for each of the books in the If You Give series. However, I’ll solely be focusing on If You Give a Mouse a Cookie, for all the stories follow a fairly similar story-line yet with different cute little critters and some additional adventures! Apparently, this book has been around for a while yet I’m only hearing of it now. During a fun-filled adventure at Chapters, my roommate and I decided to go into the children’s section. She thought it’d be fun to read me a story. Thus, we sat on the floor in the children’s section of a Chapters and she read me a picture book. We’re cool, we know. So, how was story-time? Numeroff’s tale of a boy who works hard to fulfill the constant needs of this funny little mouse is adorable and rather humorous! If I were to ever have children, this is definitely a book on my “to be read to my children” list. It’s comical, silly, vibrant, fast-paced, and rather relatable to anyone who has dealt with caring for a toddler to young child. The story is simple and straightforward. Our main character, a young boy, meets a little mouse who really wants a cookie. This initial interaction causes a chain of events; from cookie to milk and milk to a mirror, the stream of requests has only just begun! It’s a really quick and easy read, a perfect amount of content for a young child to be able to sit through without growing bored or tiresome. As I’ve just stated, the book is really fast-paced. The language is simple, moving fluidly from one page to the next. This makes it great for children, for awkward or drawn out pauses can cause a break in focus when reading literature to a child…books like this were definitely my go to when choosing what to read to kids when I had coop in a kindergarten class. It’s simple enough that parents with children at a young reading age could let their kids attempt to read the picture book to them. I love when authors do this – I’m a huge advocate of literature that allows the opportunity for children to read aloud and build their communication skills. Additionally, the language and story are easy to follow, making this an even more fantastic choice for children. Felicia Bond’s illustrations are super adorable; there are even cute drawings where the publishing content is before the story begins! This level of detail is what makes the If You Give series even more splendid, for children notice these small little nitbits. The artwork is simple but vibrant; it doesn’t take away from the words but the words don’t overpower the imagery. Rather, the two coincide with one another, allowing a balance between the illustrations and the sentences. Honestly, I think the drawings were my favourite part; they truly provide an amazing image of what’s happening in the story! It really made the fun adventurous of the boy and the mouse much more entertaining and silly, adding depth to the content and desire to read the picture book! 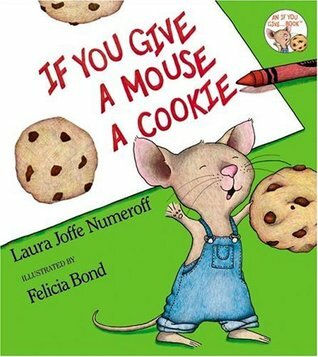 Numeroff’s If You Give a Mouse a Cookie and the other books in the If You Give series are truly astounding! They really bring to light the craziness that comes with watching young, rambunctious children! Again, this is another example of children’s literature that can be enjoyed for different age groups for different reasons; children will giggle at the absurd things the mouse asks for and adults will chuckle at the realism of these situations. I’m extremely grateful my roommate wanted to read these during one of our book browsing adventures! Are the If You Give books on your TBR list? Thanks! This wonderful person on Etsy designed them! I think I did a post on it which links to her page!! Aw this is so cute! Great review! Awe thank you! It’s sometimes challenging for me to review Childrens lit, especially when it’s small haha! Yeah I can imagine but you’re the first person I’ve seen review it and I really enjoyed it. It’s nice to read a review where the book doesn’t take itself too seriously and you can focus on different aspects of the book.